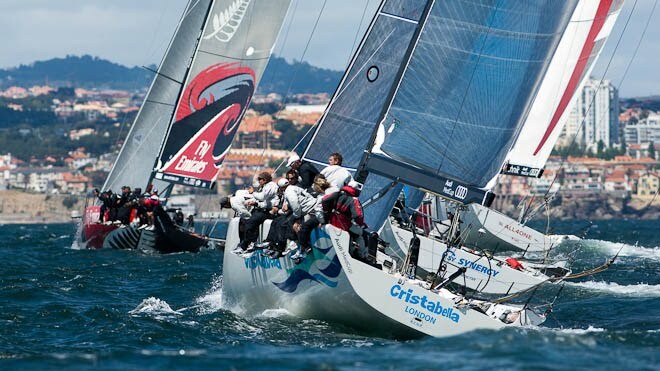 TP52 Portugal Cup leaders Emirates Team New Zealand. 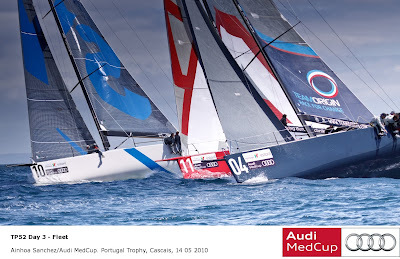 Image copyright Stefano Gattini_Studio Borlenghi/Audi MedCup. Emirates Team New Zealand (NZL) lead the Portugal Trophy, Cascais after posting a strong second and first place from the two TP52 races Friday. 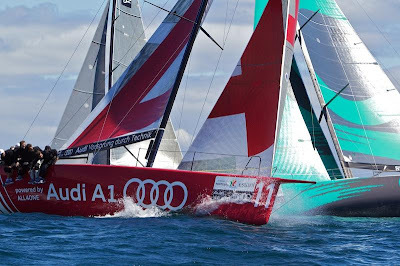 But for an error by Team Origin (GBR) which required them to take a penalty turn early in the second race, the emerging duel between the Kiwi Audi MedCup champions and the British team might be even closer. 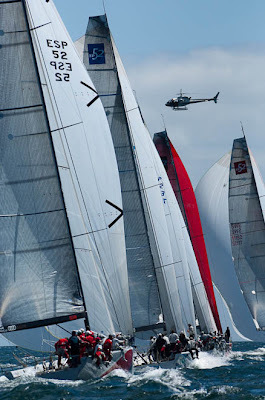 TP52 fleet downwind. Image copyright Ainhoa Sanchez/Audi MedCup. Conditions were ideal for the third day of racing for the 11 strong TP52 fleet, 16-22 knots of breeze and two good tests proved enjoyable tests for crews through the fleet. As the breeze peaked during the both races, several gennaker sails were shredded, a tough punishment for small mistakes, and consistency was never easily achieved. TEAMORIGIN 1851. 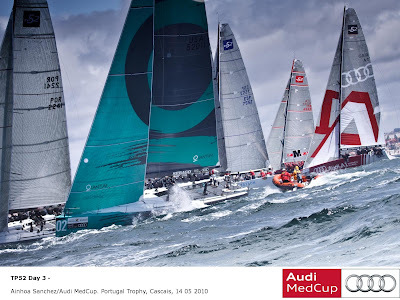 Image copyright Ainhoa Sanchez/Audi MedCup. Since their faltering opening day, when they scored a sixth and 11th, languishing at the back of the pack at the finish of Race 2, Emirates Team New Zealand are back to something close to their best. 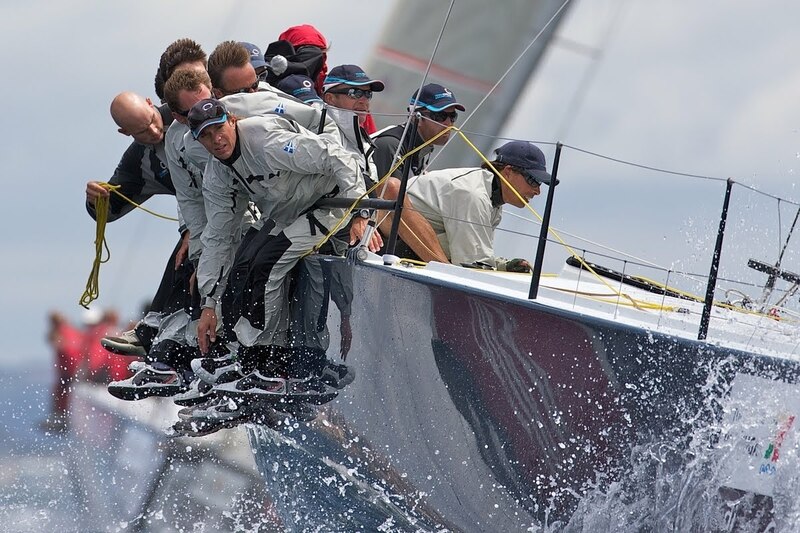 Now they have won three of the last five starts and lead TeamOrigin by three points as the TP52 Series approaches Saturday's Coastal Race. TP52 fleet downwind on Day Three of the Portugal Trophy. 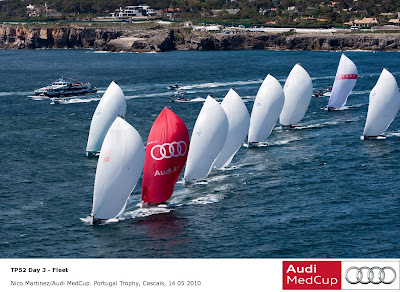 Image copyright Nico Martinez/Audi MedCup. With 2008 champions Quantum Racing (USA) remaining slightly compromised in the absence again today of skipper-helm Terry Hutchinson (USA), who was still under final observation after taking a knock on the head before yesterday, Emirates Team New Zealand have found themselves an adversary very close to their level in Team Origin who are still only on Day 3 of their TP52 racing experience. TEAMORIGIN 1851. 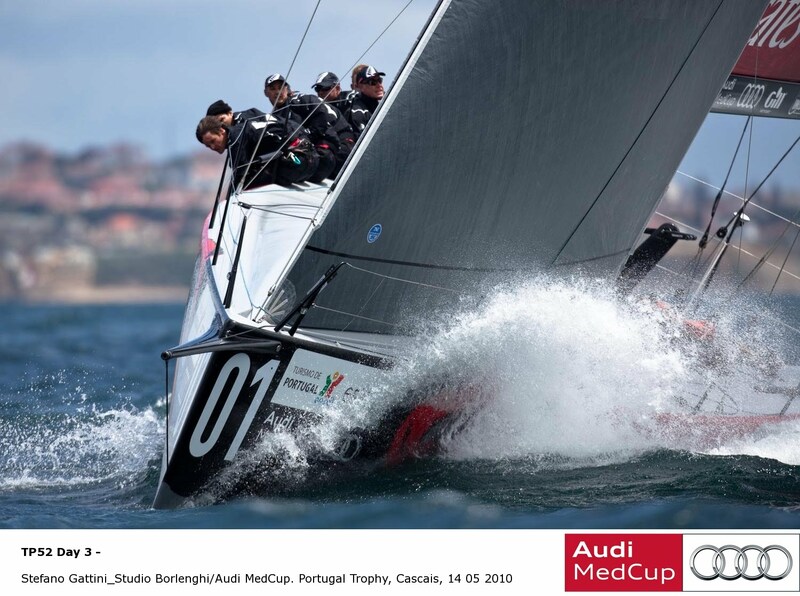 Image copyright Stefano Gattini_Studio Borlenghi/Audi MedCup. 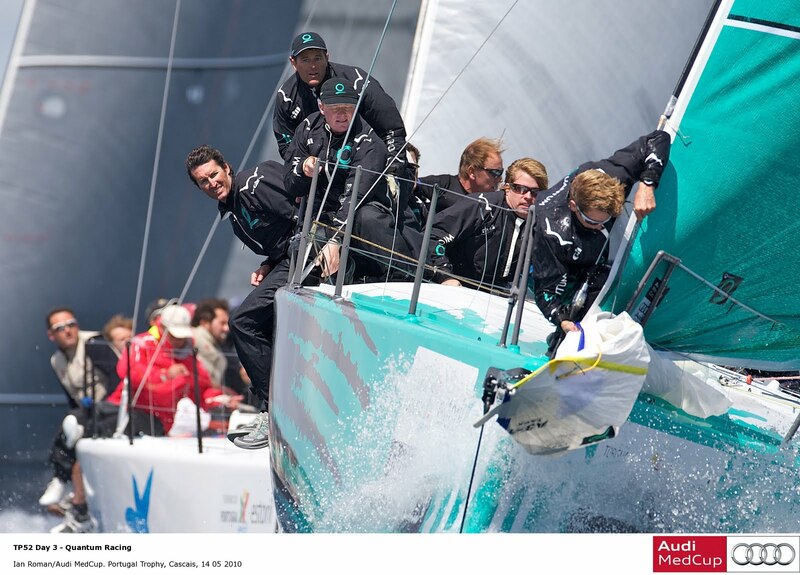 Adrian Stead (GBR) took the helm of Quantum Racing again today but, according to the Quantum Racing team, Hutchinson should be back on board for tomorrow’s coastal race. 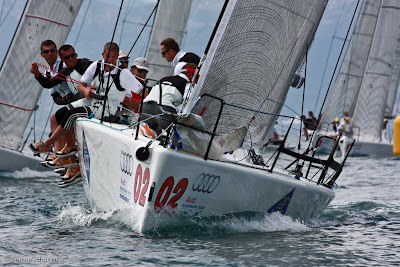 TeamOrgin won the first race and were serious contenders in the second heat of the day, until they had to take a penalty for infringing Jochen Schuemann and the crew of Audi A1 powered by ALL4ONE near the top mark. 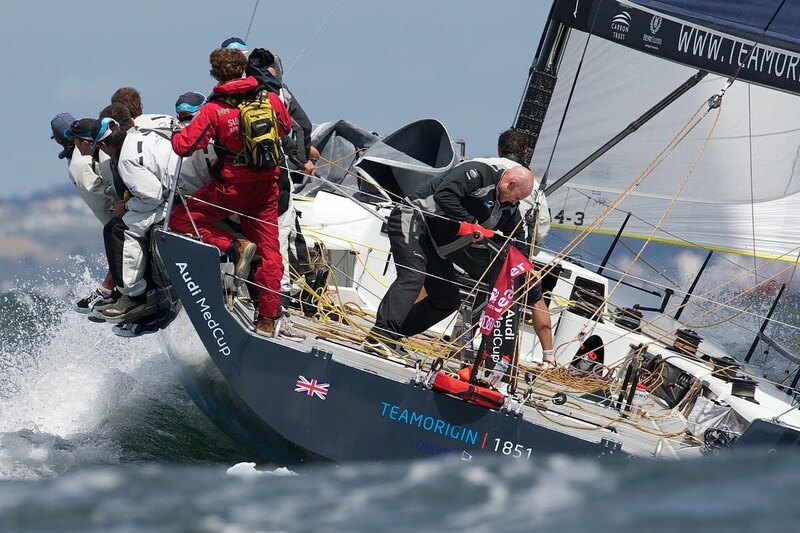 But the British team, which has a trio of gold medallists, Ben Ainslie (GBR) on the helm, Iain Percy (GBR) as tactician and Andrew Simpson (GBR) as strategist, forming their afterguard has otherwise been consistently strong starting and nailing the vital windshifts. Percy spoke yesterday of not putting themselves in potentially expensive positions, and so they will draw important conclusions from their de-brief today. Synergy, Audi A1 Team powered by ALL4ONE and TEAMORIGIN 1851. 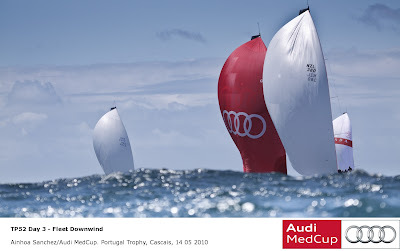 Image copyright Ainhoa Sanchez/Audi MedCup. The Russian team on Synergy, with Karol Jablonski (POL) as helm and Rod Dawson (NZL) as tactician, have been impressive with their regular results – third in the second race today – keeps them two points ahead of Torbjorn Tornqvist’s Artemis (SWE) which paired a second to a seventh today. Luna Rossa. 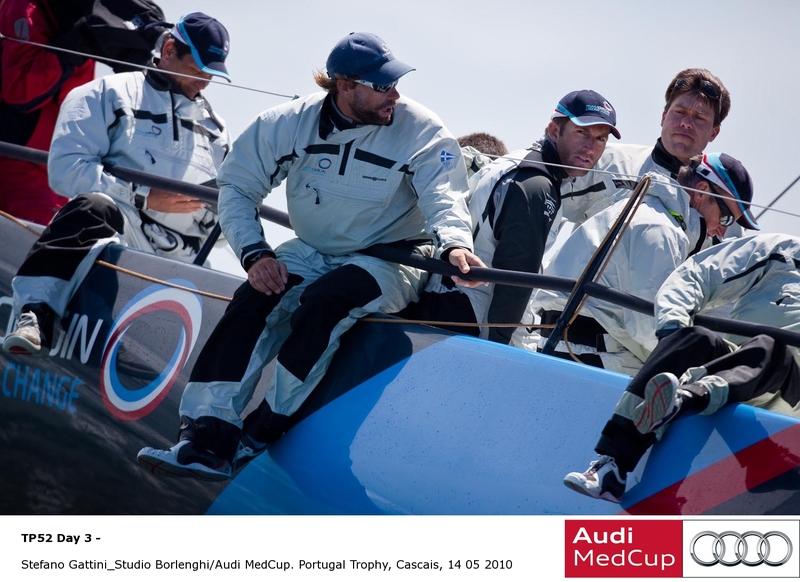 Image copyright Stefano Gattini_Studio Borlenghi/Audi MedCup. Emirates Team New Zealand lead off the pin end of the start line and were able to get to the favoured right side of the course early to gain the initial advantage along with TeamOrigin. But TeamOrigin managed to get a better wind shift slightly inshore to round in the lead ahead of Team New Zealand. 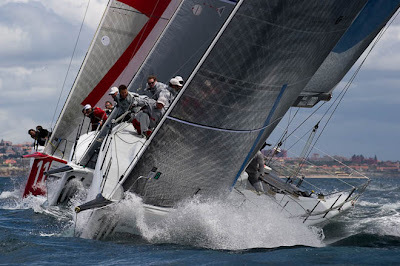 TP52 fleet upwind. 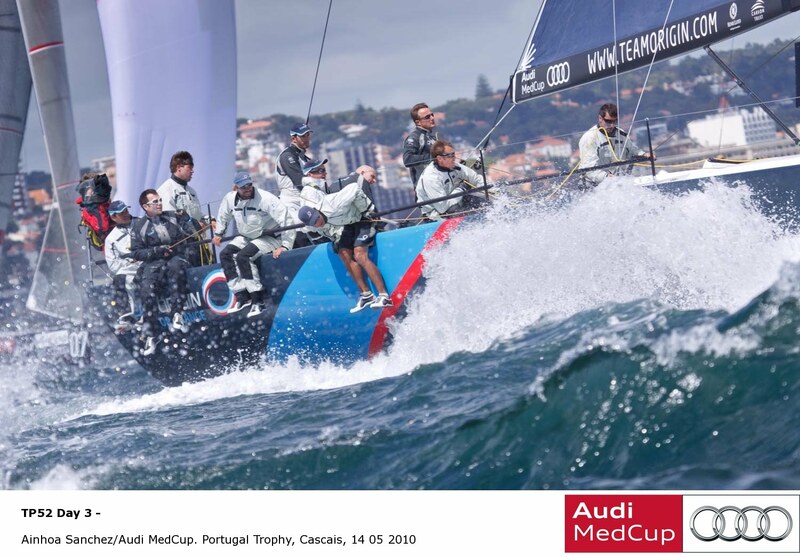 Image copyright Stefano Gattini_Studio Borlenghi/Audi MedCup. The breeze built from inshore on the last run, when Emirates Team New Zealand stayed further off. 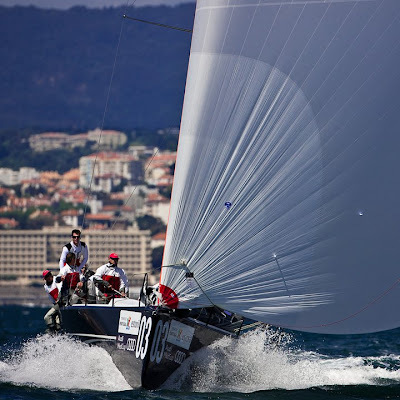 After gybe setting, as did TeamOrigin, Bribón (ESP) stole ahead of the champions on the final run, challenging for second, but when a problem with their spinnaker sheet after their final gybe, just 100 metres from the finish line, dropped the Spanish boat to fourth. TeamOrigin won comfortably and Luna Rossa (ITA) gained on the final run to earn third. Bigamist 7. 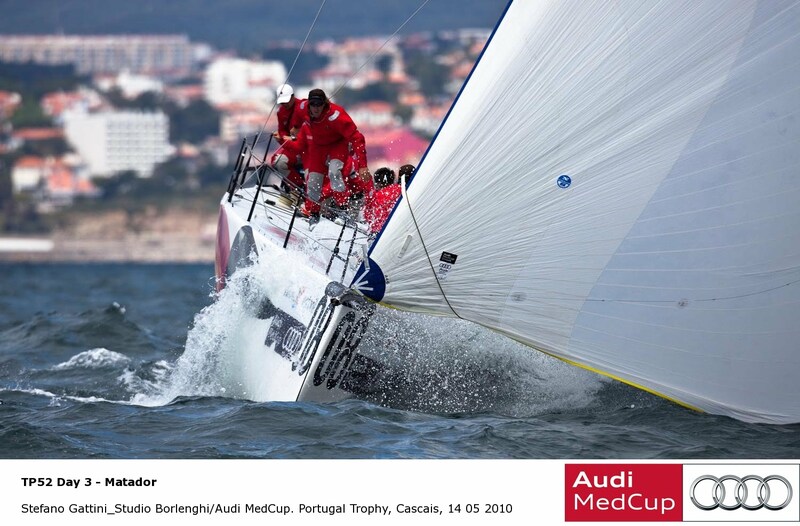 Image copyright Stefano Gattini_Studio Borlenghi/Audi MedCup. Emirates Team New Zealand lead from the first mark to the finish line, with another display of cohesive team work and immaculate tactics. With the breeze peaking at over 23 knots, the action near the windward mark which was some 600 metres off the shore, was intense and exciting. Artemis took second place. The reigning Audi MedCup champions are showing themselves as the team to beat, as the Canarias-based Puerto Calero (ESP) team extended their lead in the GP42 Series on impressive scores of 2-1-2 in the three races sailed today. Their consistency has put them in a 4-point lead over their B&C-designed sistership, Madrid–Caser Seguros (ESP), who finally put a win of their own on the scoreboard for the first time today. Puerto Calero. Image copyright Nico Martinez/Audi MedCup. Windy indeed: the brisk northwest breeze today topped 22 knots, and seas built up to 2 metres, making upwind sailing a jarring ride at times but downwind an absolute blast, with all boats surfing at high speed on the 8-mile courses. Nonetheless, the teams are aware of the chess game chase for points at this halfway point in the competition. Matador and Luna Rossa. 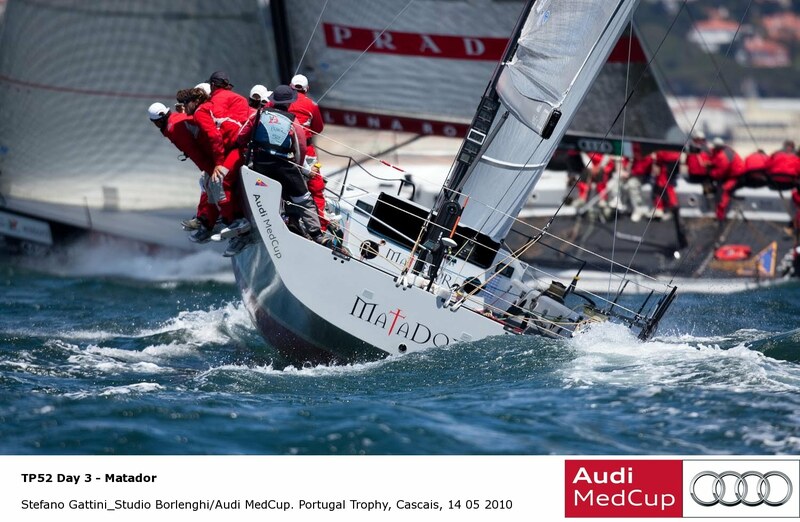 Image copyright Stefano Gattini_Studio Borlenghi/Audi MedCup. Quantum Racing. 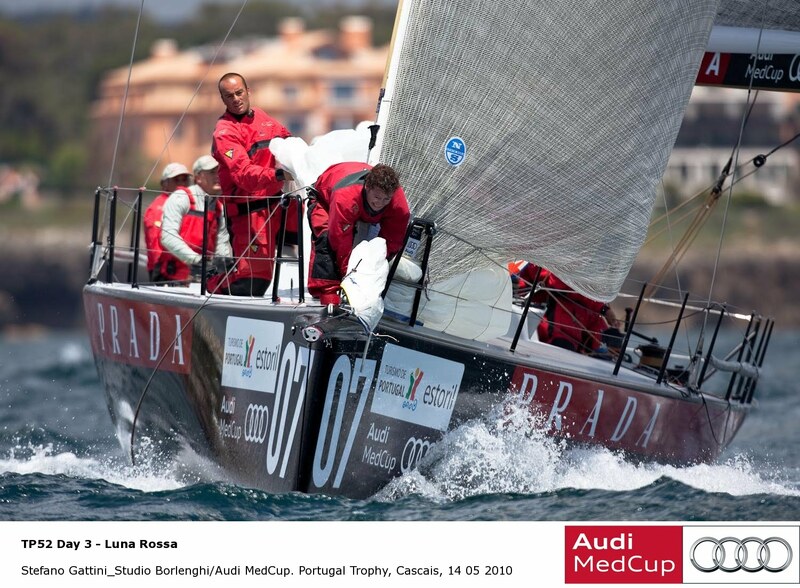 Image copyright Ian Roman/Audi MedCup. 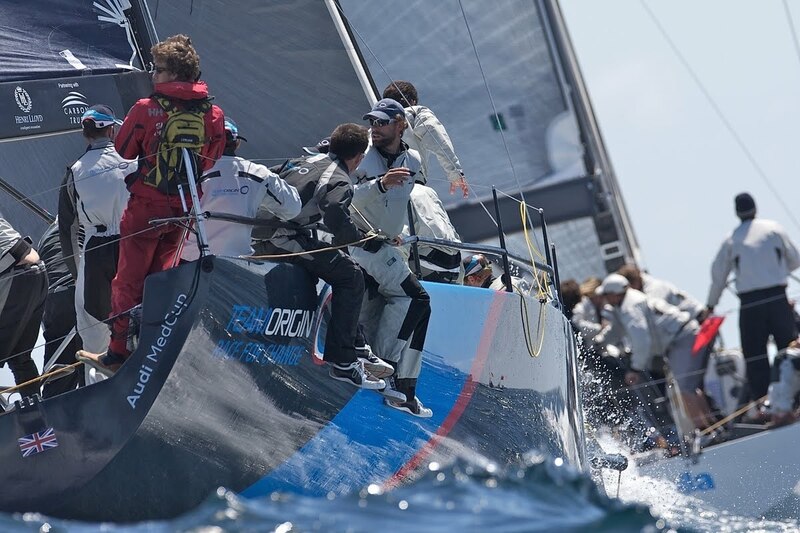 “ We are learning the whole time that we are sailing, it's the ninth or tenth time on the water with the boat, and now also our eighth or ninth race in the TP52 Circuit for most of us, not our fifth or sixth year so we couldn't be happier with how it's going. “ It's exactly what we hoped, race is amazingly tight, the fleet is very, very competitive, the start line are incredibly intense. “It is ticking all the boxes we hoped it would. We chose to take a penalty, it was a very close port starboard at the top mark. We got a pretty unlucky, a little windshift right at the top when we were trying to cross the Audi A1, right at the port hand layline. 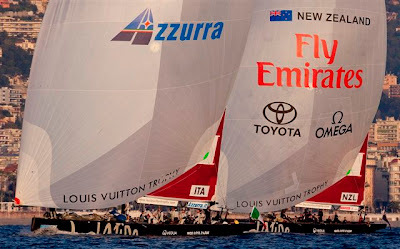 Emirates Team New Zealand. 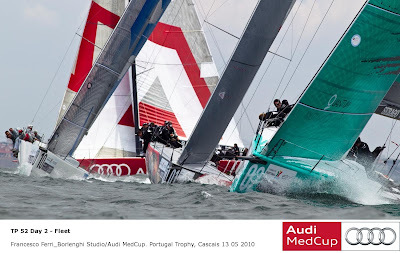 Image copyright Ian Roman/Audi MedCup. “ The standard is much higher than last year. The teams have put in more time preparing. The boats are all in very good condition and certainly the fleet seems to be cruising along pretty much the same speed, so it's all about small gains here and there. TeamOrigin has picked up very quickly and are very tough competitors. “ We made a lot of mistakes during the first day, but we've sailed much better during the last two days. 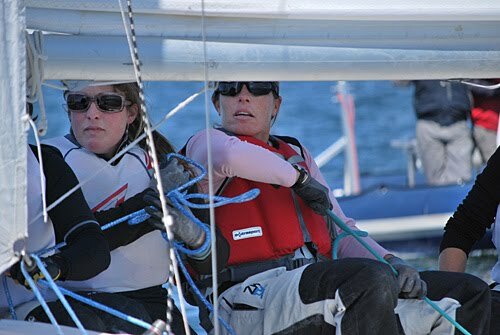 “ At the last top mark, we were trying to hoist our kite but we lost the tack line so it wasn't fixed to the bowsprit anymore, just to the sheet, and in this wind that's a big problem of course, and then it's very difficult to control de boat. It was flying up and to leeward. With spinnaker you sail at 20 knots, and so without the kite you lose a lot of speed and that has cost us two boats, which was a pity since we were at third position for almost the whole race. 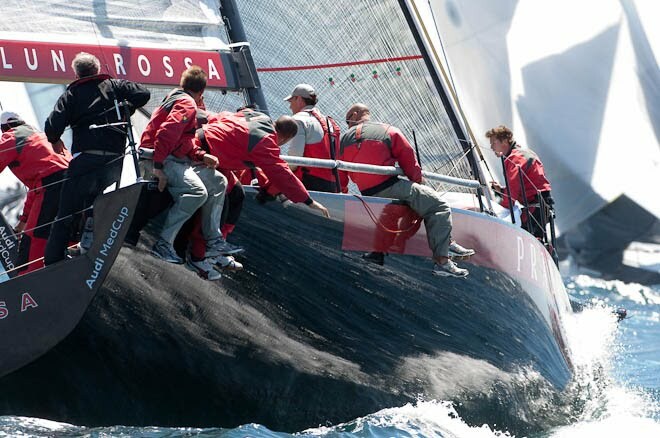 Luna Rossa and Synergy. 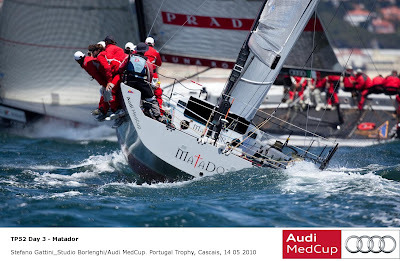 Image copyright Ian Roman/Audi MedCup. TP52 fleet. 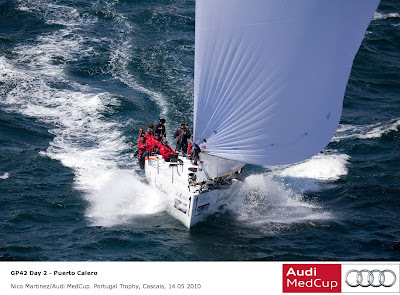 Image copyright Ainhoa Sanchez/Audi MedCup.
" The key is not making any mistakes and we've managed not to make any and be as consistent as possible. Races were very even, and we've had to wait till the last minute to know who was going to win, so we've decided not to take any risks and sail more conservatively. The most important thing is that we've been fighting to win and we've managed one first and two second places in the three races. We are happy and we must keep on sailing cool headed.
" We are very happy with today's victory, happy cause yesterday we had a bad time tunning the boat, and we've solved it today. We've managed to concentrate and sail better, and the boat is performing much more consistently, so we've been able to concentrate on the tactics." Matador. 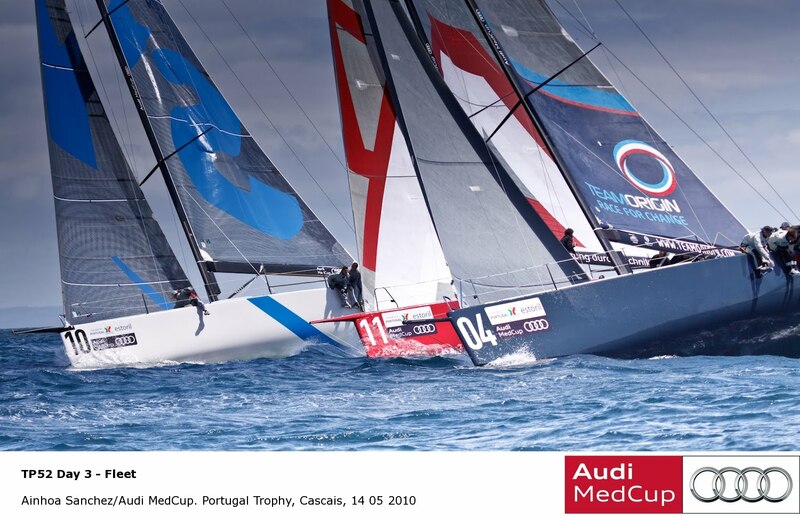 Image copyright Stefano Gattini_Studio Borlenghi/Audi MedCup. 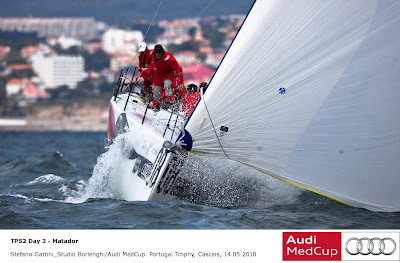 Artemis in the Audi MedCup off Cascais. 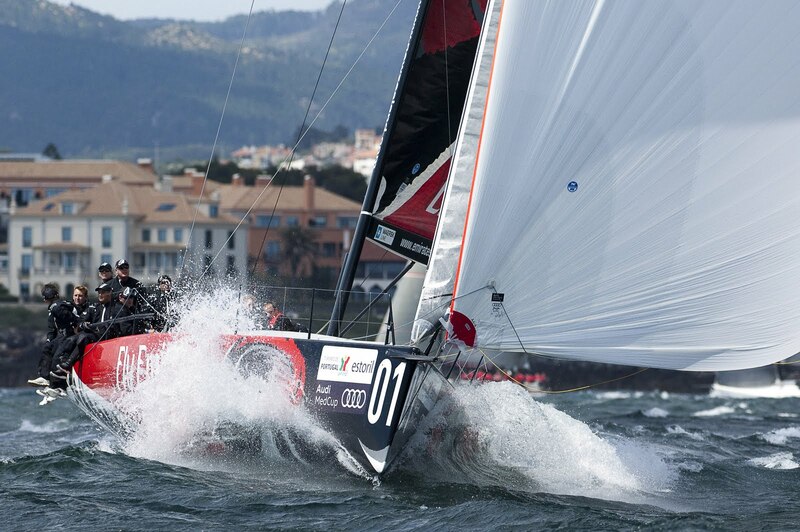 Image copyright Artemis Racing/Audi MedCup. Two great races again today in 15-25 knots of wind from the Northwest. We had a bit of rain, but the wind really made the racing exciting with the boats planing at over 20 knots downwind. Onboard ARTEMIS we had a good day and moved up in the standings from 7th to 4th. We did not have good starts in either race but made great comebacks by playing the very shifty wind to finish 7th and 2nd. TeamOrigin won the first race but stumbled a bit in the second by fouling ALL4ONE at the first mark and the finished 7th. Emirates Team New Zealand had a great day with a 2, 1 and now lead the series with 26 points to TeamOrigin with 29. The Russian team, Synergy is third with 34 points just two ahead of ARTEMIS with 36. ALL4ONE is 5th with 37. Saturday will be the coastal race down to Lisbon and back... about 25 miles. Good breeze is forecast so it should be a fairly quick race. The current will be tricky near Lisbon as there is a big river outlet to the ocean. Emirates Team New Zealand leads on the way on Day 3 of the Portugal Trophy. Image copyright Chris Cameron/Emirates Team New Zealand. 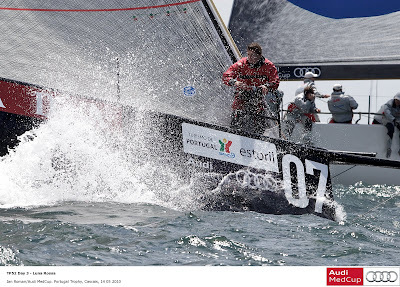 Emirates Team New Zealand has sailed into the lead of the Audi MedCup regatta in Portugal, finding the consistency they were after on day three of racing. 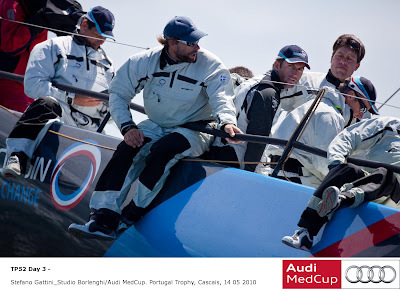 In ideal conditions off the coast of Cascais – winds ranging from 14 to 25 knots making for fast and furious sailing – Dean Barker and his crew posted their best day yet, with a win and a second placing. 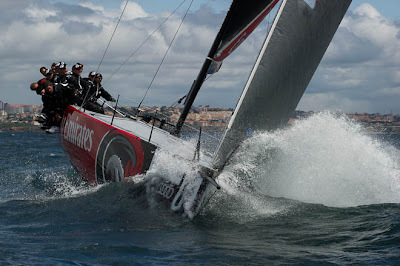 They now lead the fleet by three points, overhauling the British TeamOrigin boat, skippered by former Emirates Team New Zealand team member Ben Ainslie. Synergy leads a bunch of TP52s. Image copyright Chris Cameron/Emirates Team New Zealand. Barker described it as a day where everything went well for the team, winners of the 2009 Audi MedCup. 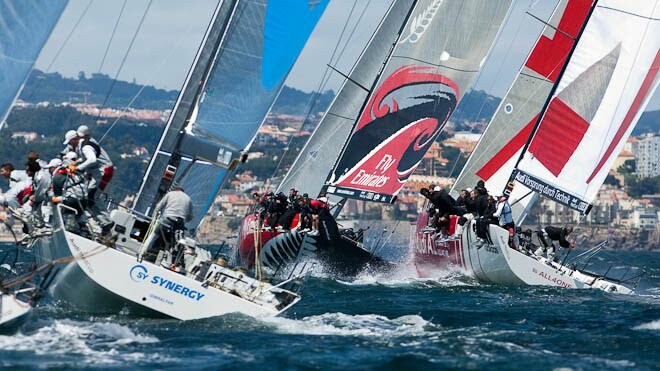 But he’s conscious of the snags - a stronger fleet this season and the erratic Cascais conditions - that can still catch out the top boats. Emirates Team New Zealand and Synergy on Day 3 off Cascais. 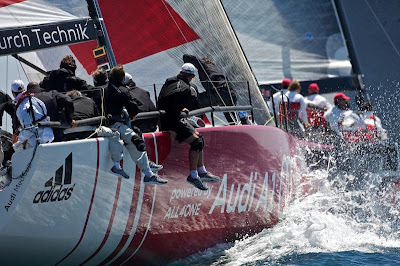 Image copyright Chris Cameron/Emirates Team New Zealand. “Over the last couple of days we’ve certainly eliminated mistakes,” he said. “But you could throw a blanket over the fleet at this stage. We feel like we have a small advantage on the boats around us, but not enough to rely on. 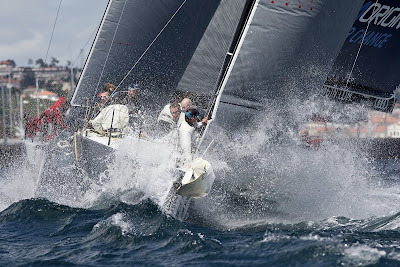 TP52s downwind. 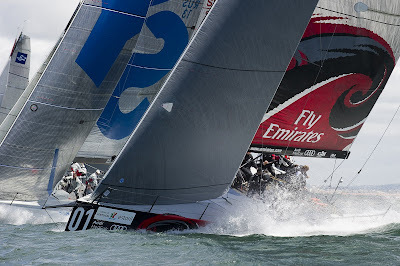 Image copyright Chris Cameron/Emirates Team New Zealand. “It’s a case of starting well, trying to anticipate the first windshift, working out where we need to be three-quarters of the way up the first beat, and then try to capitalise on our position against the fleet. So it’s just small things all the way around the course where you try to do a bit better. Emirates Team New Zealand leads upwind. Image copyright Chris Cameron/Emirates Team New Zealand. 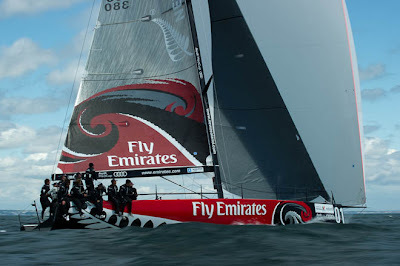 Emirates Team New Zealand. Image copyright Chris Cameron/Emirates Team New Zealand. Emirates Team New Zealand did not have those troubles to deal with today, as they were constantly among the leading boats in both races. In the day’s opening race, NZL380 got a good start at the pin end of the line, and were able to work their way to the favoured right side of the course to lead the fleet with TeamOrigin. The British boat picked up a better windshift slightly inshore to round the first mark in the lead and keep it to the finish. Luna Rossa. Image copyright Chris Cameron/Emirates Team New Zealand. “We made gains on them here and there, and managed to hold off Bribon on the final run. But in the end, a second place was a good solid result,” Barker said. “In race two we got a nice start up the line and we were neck-and-neck with TeamOrigin going for the right of the course, before we managed to open up a bit of a lead at the top mark. We sailed a really good race from there for a good win. So all in all, a very good day. Barker acknowledged the strength of the TeamOrigin crew, new to the TP52 circuit this season. Audi MedCup: TEAMORIGIN Win Their First Audi MedCup Race! 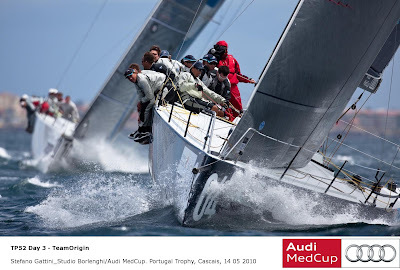 TEAMORIGIN led the way in race 6 at the Audi MedCup Portugal Trophy. Image copyright Ian Roman/TEAMORIGIN. Yet another perfect day on the water here in Cascais with thrilling conditions and these exciting boats showing their true colours in challenging conditions. TEAMORIGIN achieved their first race win in their new boat in race one and a 7th place in race two leaving them in 2nd place overall on 29 points behind Emirates Team New Zealand on 26 points. Tomorrow sees a change of pace with one coastal race scheduled. 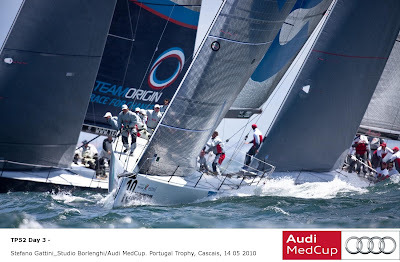 TEAMORIGIN at the Audi MedCup Portugal Trophy. Image copyright Ian Roman/TEAMORIGIN. An exciting finish to Race 6 of the TP52 Series with squally gusts presenting great opportunities for gains and losses, but TeamOrigin (GBR) finished comfortably ahead of second placed Emirates Team New Zealand (NZL). Bribón (ESP) looked to have stolen second from Emirates Team New Zealand (NZL) when they crossed in front of the Audi MedCup champions but within 150 metres of the line they could not sheet their gennaker back on after their gybe and they dropped to fourth. Luna Rossa (ITA) steered by Robert Scheidt (BRA) got third, equal to their best result so far. 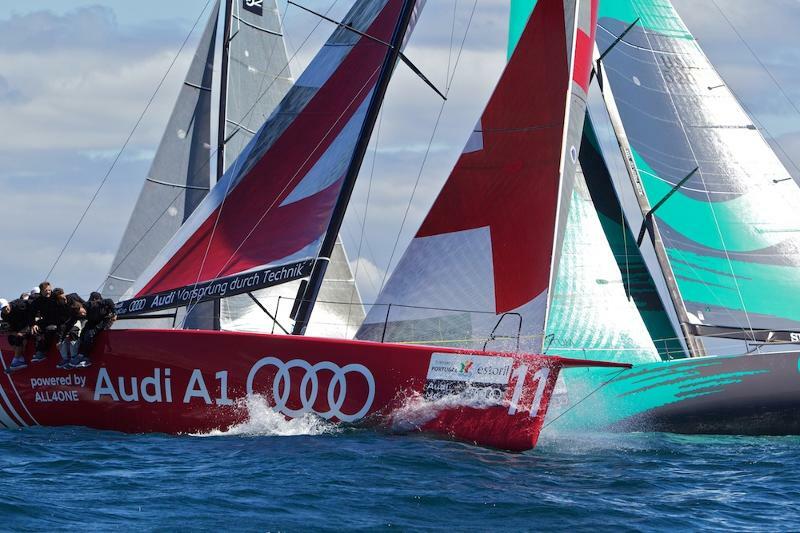 The second race saw another win for Emirates Team New Zealand, their fourth from seven starts, and that sees the Audi MedCup Champions take the overall lead of the Portugal Trophy. They were close with TeamOrigin (GBR), jousting for advantage up the first windward leg but the Kiwi champions managed to get ahead before the turn. TeamOrigin (GBR) dropped when they took a penalty turns for an incident near the top of the second upwind leg, an expensive error, but they fought back to seventh. 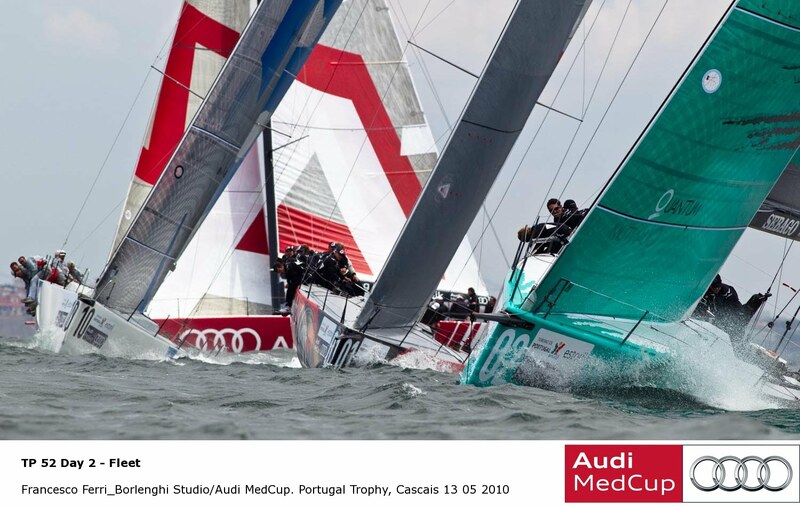 Close racing at the Audi MedCup Portugal Trophy. Image copyright Ian Roman/TEAMORIGIN. Iain Percy, Tactician, "Another fun day racing today. We almost had a very solid day, but one little misjudgement cost us. I was very pleased at how we responded to that mistake though, it is making the most out of those bad races that this long series is all about." Andrew Simpson, Strategist, "The first race was great, from a good start to good boat handling and solid tactics. The 2nd race was looking really good, we had a slight incident with All4One and we did a penalty turn to be safe. The boys all fought really hard to get back into the race and did well to get 3 places back. " Coastal race, scheduled start at 1300. 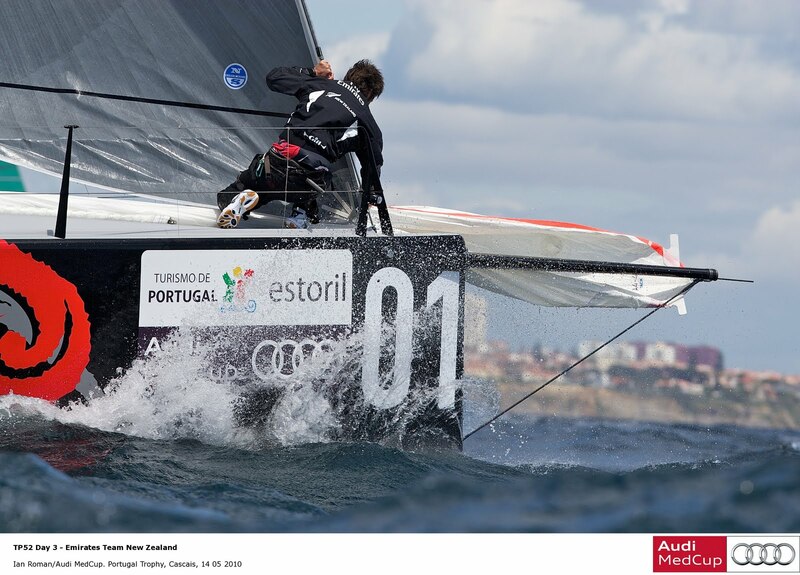 Audi A1 Team powered by ALL4ONE continues to improve on another breezy day at the Audi MedCup Portugal Trophy. Image copyright Richard Walch. Two more races and two fifth places today in Cascais: even if Audi A1 powered by ALL4ONE doesn't have as much experience as the other TP52 teams regarding manœuvres and boat preparation, the French-German team's crew members continue to do a very good job on the races, and their fifth place in the provisional overall ranking proves that the team really got into this new game. Jochen Schümann, Skipper: "it was a windy day and we had a lot of little breakdowns on our boat, making that we couldn't prepare our starts the way we wanted. But on the first race we sailed quite well in the middle of the fleet after a first good upwind leg, and then we made a big improvement downwind today, with a very good speed. Very similar situation in the last race where we came late on the start line because of a last minute repair, then we sailed a very good first upwind leg, being in 3rd position most of the race from there, but we encountered a problem with the spinnaker's tackle, and unfortunately two boats passed us before we got in control again. Still a good day for us in the end, because we had the potential to finish in the top 3 again in the last race." Audi A1 Team powered by ALL4ONE. Image copyright Richard Walch. Christophe André, Grinder: "We are quite satisfied of the start we had on the first race, but not of the final result. On the second race we were really happy of the first three legs. But on the last leg downwind, we had a mechanical problem with a spinnaker tackle, and as it was very windy, we did a handling mistake on board, and lost control of the spinnaker for about one minute. And the boats are so close that we lost some places that could have been good for us to finish in the three firsts. So we are a bit disappointed, as we had the means to do a good second race, but we will have to be even more careful on the boat's preparation." Only one race on the programme tomorrow: the "coastal race", with long legs hiking for the crew, and a lot of work on the boat speed. 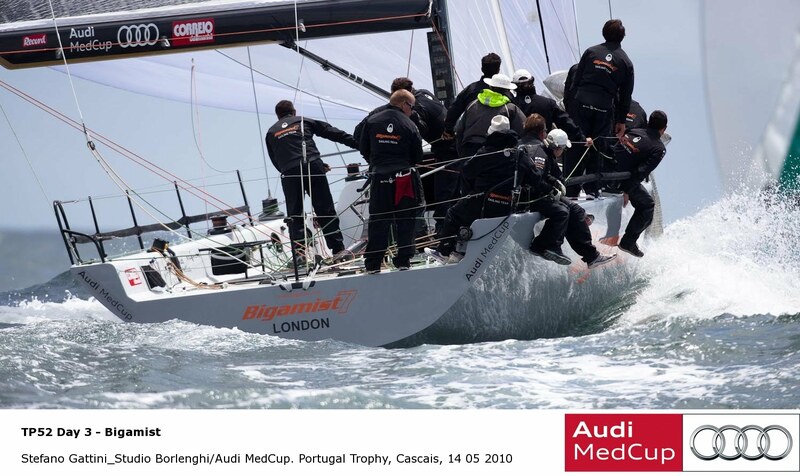 Racing is live everyday on www.all4onechallenge.com/audia1 thanks to Audi MedCup TV's player. (First start 13h00 local time). The Banque Populaire V crew. Image copyright B. Stichelbaut/BPCE. The Maxi Banque Populaire V left the port of La Ciotat at 17h30, in the direction of Marseille and the start of the attempt on the Mediterranean Record. Greeted by many members of the public, present for the Ascension weekend in the little port of Bouches du Rhône, Pascal Bidégorry and the 11 members of the team slipped their mooring at 17h30 to head for the starting position located between the ancient Sémaphore de Frioul and the Centre Nautique du Prado. In a few hours they will start on their attempt at the record over 455 nautical miles, held by Franck Cammas since the 16th May 2009 in 17 hours 8 minutes and 23 seconds. Molly, Anna Trimming Hard. Image copyright Dave Johnson, USSTAG, May 2010. The sun was out today in Newport and we had a beautiful day sailing. We finished up the round-robin in first place despite dropping one more race today, and advanced to the semi finals against Katy Lovell. We completed two races and are currently 2-0. The day started with a chilly northerly breeze around 10kts. The current was flowing fast down wind which made for tricky long upwinds. We had three races in these conditions, with our last race being the closest race of the regatta thus far. In the last race, despite controlling the entire start, I made a mistake in the timing as we headed back for the start line and were behind just after the starting gun. We were behind by two boat-lengths at the top mark, but they misjudged the downwind layline and we caught back up to them. On the second beat, we managed to pass them and take the lead at the top mark. Downwind, the wind started to get very light. Half way down the leg, I looked up and saw a big line of breeze coming from the opposite direction. We quickly put up our jib and doused our kite, and managed to stay ahead of the other boat for the win. After the wind changed directions, the race committee moved the course right into the mooring field between Ft. Adams and the NYYC. We finished our races there in a shifty and puffy 10-14kt breeze. The starts were exciting, and the racing much closer since the shifts were quite small and random. We lost our first race in these conditions to Sally Barkow despite having a great start and winning the side of the line that we wanted. Right after the start, we made the mistake of switching sides with her, and the breeze filled in on the side that she was on and there was no catching her from there. The other two races were close but we went on to win them to finish the round robin with a 12-2 record. 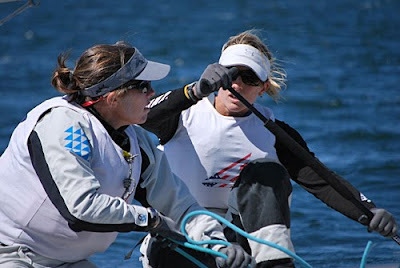 Behind us in second was USSTAG team mate Genny Tulloch with a 11-3 record, and Sally in third with a 9-5. In fourth place was Katy Lovell whom we were matched up against for the semi's. We started the semi final rounds with the intention of only completing two of the flights today. We had a great first start with Katy and she drew two penalties meaning she had to spin one right off the line. From there we took a nice lead and held on to it for the finish. The next race, we again controlled the start but relinquished control with 20 seconds to go and gave her the better start. She pinned us out to the port layline which meant we had to follow her into the top mark. Downwind, we managed to get an overlap with luffing rights, but it wasn't quite enough to hold her out past the layline. She rounded the bottom mark and in a close match up wind, she still managed to round just ahead of us. Downwind, she opened the door for us to gybe on her wind and we took advantage of the opportunity to roll her and beat her by a boat length a the finish line. It was a close race and we had a lot of fun doing it. Tomorrow is the final day of the regatta. We will complete the semi-finals and then do the finals or the petit-finals. Azzurra competing against Emirates Team New Zealand in Nice. Image copyright Stefano Gattini. The countdown is on with just over a week to go until the start of racing in the third event of the Louis Vuitton Trophy, scheduled to be held in La Maddalena, Sardinia from 22nd May to 6th June. The crew of Azzurra, flying the burgee of the Yacht Club Costa Smeralda, have spent the past weeks training (in Valencia on America’s Cup boats) and competing in regattas (Olympic classes, match-race and one-design) and are now preparing to return to Porto Cervo. The YCCS Clubhouse which will be the team’s operational base during the La Maddalena event. Team Azzurra, together with fans and spectators arriving in Sardinia, will be welcomed by the YCCS’s legendary International 12 Metre yacht Azzurra which has been completely restored to her original splendour and is now on display at the arrivals zone of Olbia Costa Smeralda Airport. Azzurra rose to fame when in 1983 she became the first Italian participant in the America’s Cup, reaching the semi-finals of the Louis Vuitton Cup. Her restoration was entrusted to the Maxi Dolphin shipyard in 2009 and entailed nine months and 6,000 hours of work. The hull was completely recoated with an epoxy matrix. The surface was repainted to recreate the exact original colour scheme, thanks to a sample found in the archives of the Valliccelli offices. In order to bring the deck to its original condition, the restoration team had to study in detail all the images and drawings of Azzurra at the time of her launch. The deck, which over time had suffered the effects of oxidation, had to be completely taken apart, anodized and polished; some elements, which had been lost, had to be meticulously recreated from scratch. Azzurra was recently exhibited at the Milan boat show before being brought to Olbia where she will remain throughout the summer season. 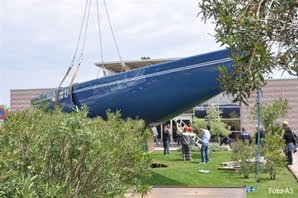 Azzurra '83 is installed at Olbia Costa Smeralda Airport. Image copyright Alessandro Sorgia. 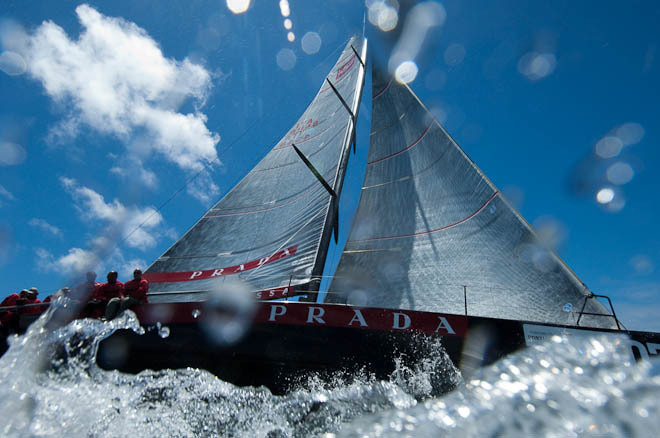 The Louis Vuitton Trophy – La Maddalena will begin on 18th May with official training sessions for the teams aboard the four America’s Cup Class boats provided by the organization: ITA 90, ITA 99, USA 87 e USA 98. The format of the event provides for an initial Round Robin where each team will meet each of their opponents in turn. The top eight teams will then progress to the next stage where the top classified teams will compete against those in the bottom half of the classification. The winning teams will then go on to race in the semi-finals and finals. Ten of the strongest teams in the world, representing eight nations, will compete in the Louis Vuitton Trophy in La Maddalena and a further two renowned Italian teams will participate alongside Azzurra: Mascalzone Latino Audi team, Challenger of Record for the 34th America’s Cup, and Luna Rossa. America’s Cup Defender BMW ORACLE Racing will also participate, as will Emirates Team New Zealand, winner of the Louis Vuitton Trophy in Auckland (March 2010) who were defeated, however, by Azzurra in the event held in Nice (November 2009). Banque Populaire V. Image copyright B. Stichelbaut/BPCE. The Maxi Banque Populaire V, currently at La Ciotat preparing for its Mediterranean record attempt, should attack, tomorrow morning at dawn The Mediterranean Record. 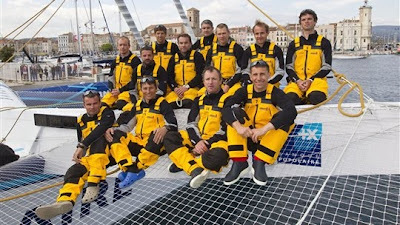 Pascal Bidégorry and his crew, already holders of the Records of the Atlantic North and the 24H, will leave the Harbour of La Ciotat at the end of the day in the direction of Marseilles and the starting line of this record of 455 nautical miles. 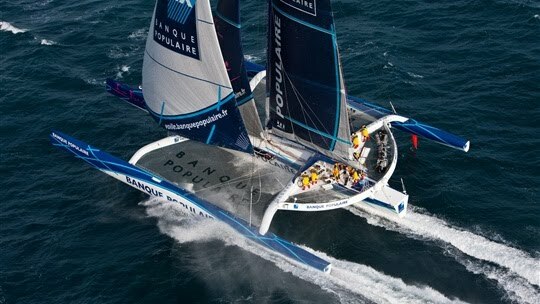 It is already a little more than a month that the Maxi Trimaran Banque Populaire exchanged the freshness of the Atlantic for the quietness of the South. There has been a training series on Mediterranean, very enriching but also permitting an opportunity to greet the public and the assistants of Banque Populaire. Competitors above all, Pascal Bidégorry and his men have therefore decided to take this timely forecast window to attempt the Record of The Mediterranean. The elements seem to be on their side this weekend of the Ascension to realize an "Express" crossing of the Mediterranean from Marseilles to Carthage; the 455 nautical miles between France and Tunisia. 17 hours 8 minutes and 23 seconds to beat! And for that, the Basque sailor has surrounded himself with a crew of 11 men, all impatient to be off! "We have an interesting opportunity: with the wind at 30 to 35 knots it will be necessary to be vigilant, for that will be powerful. It will be necessary to go quickly without stuffing up!" says Pascal Bidégorry. The sailor of the Maxi Banque Populaire envisions a departure on starboard tack, and to align with a trajectory to the South of Sardinia, the aim being to undertake as few manoeuvres as possible. "There will be a small gap of one or two hours to quickly place the boat on a good trajectory. The departure timing will be critical for the continuation." The only unknown at the moment: will the wind remain with the boat to the finish? 455 nautical miles! A very short distance that does not permit the least error, "from the point of view of the forecast, a minute alteration can very quickly stop the crossing." And the Mediterranean is crammed with uncertainties "The sea becomes short and choppy very quickly when there is wind. That makes everything become very athletic and chaotic quickly, and therefore difficult to make speed. As for the forecast, we know equally that it can change quickly but for the moment, the indications are coherent." In expectation, a after spending tonight in the bay of Marseilles, the Maxi should set off tomorrow morning at the first glimmers of day. "We were there in training and this will be a superb navigation with a precise objective, which is more interesting. We will take advantage, equally, of the return to continue our training" concludes Pascal. A representative of the WSSRC, World Sailing Speed Record Council, set up in 1972 by the international sailing federation to measure in an impartial way sailing records, is in charge of validating this attempt of Record. Time to beat: 17H 8MN 23S; this is henceforth for the men of the Maxi Trimaran Banque Populaire V to play with! 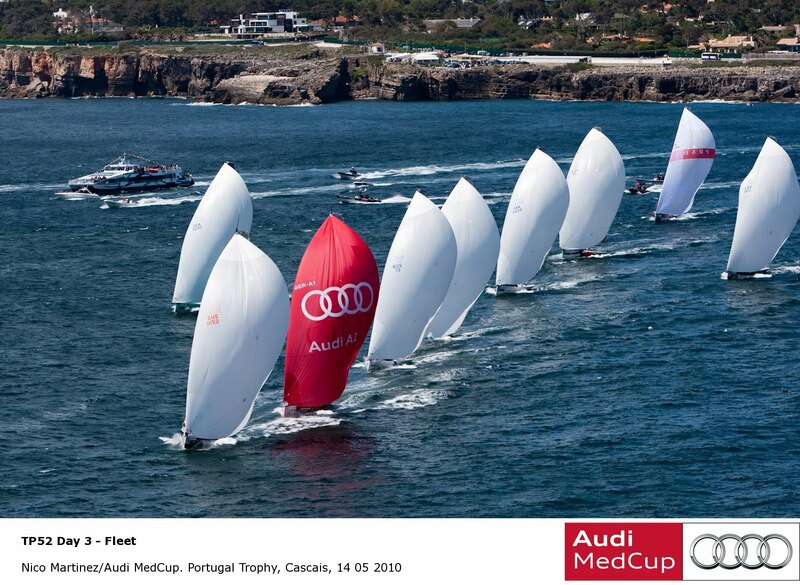 Audi MedCup: It's Tight at the Top! Close racing in the TP52 fleet at the Portugal Match Cup off Cascais. Image copyright Francesco Ferri_Studio Borlenghi/Audi MedCup. 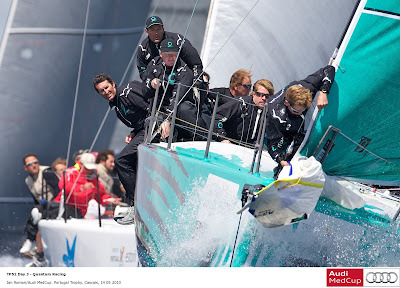 Quantum Racing (USA) will still race today without skipper-helm Terry Hutchinson (USA) with tactician Adrian Stead (GBR) standing in as helm again. Hutchinson is under observation for his head knock which he sustained before racing yesterday but is expected to return for Saturday’s coastal race. In the GP 42 class two wins yesterday for defending champions Puerto Calero (ESP) means they go into their third race with a two points lead. The wind forecast for the day promises winds slightly lighter than yesterday, 13-20 knots from the North West. 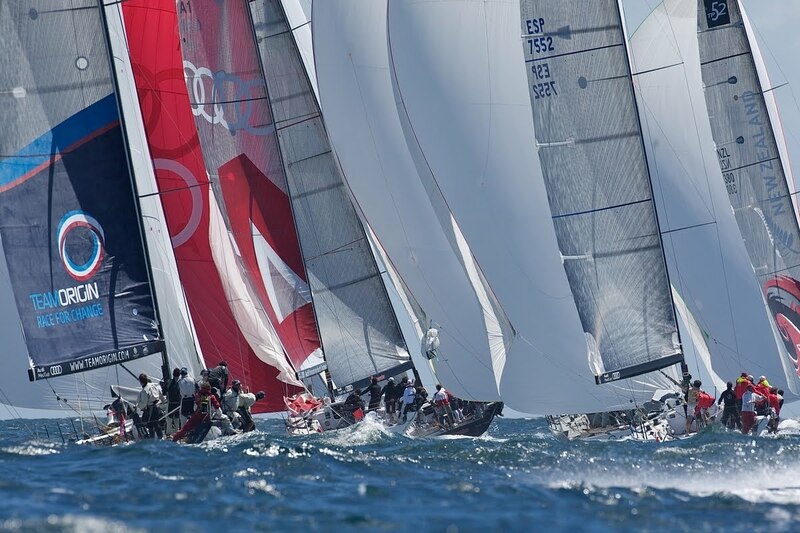 The Audi Melges 32 European Championship got underway today in Cagliari and out front, waving the British flag, Joe Woods on Red with tactician Paul Goodison and Peter Rogers on Highlife, flanked by Ruaridh Scott are tied for first place overall. The two British teams surprised everyone as they were not amongst the list of teams immediately favored to lead the event after three amazing races. Woods sits in first, and Rogers in second on countback. The day began with a light, south wind around 8 knots. Lanfranco Cirillo on Fantastica with Michele Paoletti called for a strong pin end start. The English team was quick to get out front with Cirillo following. The racing got tighter as the breeze diminished, a situation that only the best tacticians can surely handle successfully. 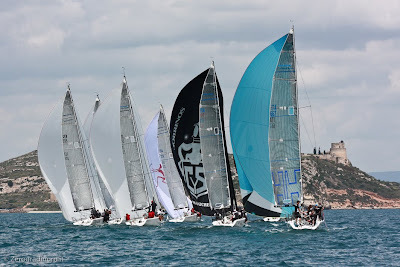 They commanded to the finish line with Luca Lalli and tactician Lorenzo Bressani on BLinSailing.com in third, Cirillo in fourth and Francesco Martino with tactician Alberto Bolzan on Pilot Italia finishing fifth. The wind shifted steady to the right for race two. Carlo Alberini on Calvi Network and tactician Gabriele Benussi wanted to quickly forget the opening round as it was certainly not their best performance (they eventually retired in the third and final race due to a broken backstay after contact with Martin Knetig on Black Mamba). Alberini had a nice groove on the first leg, working themselves closer and closer to the group that included Cirillo and Rogers. It was a photo finish for Rogers, thanks to a perfect jibe, taking control and the win ahead of Cirillo in second, Alberini finished third. Jean Francois Cruette on Teasing Machine beat out Lalli after a prolonged duel to take fourth. The breeze intensified for the final round, 15 knots at 230 degrees. Everyone agreed that the right side looked the best, but Brontolo’s Filippo Pacinotti with tactician Freddy Loof had the courage to choose the left looking for pressure, rounding the top mark in first. Behind him, Woods was waiting for just the right moment to make an aggressive move for the lead, tacking to the right anticipating that Pacinotti would relinquish control of the lead. Woods took charge and the win with Pacinotti finishing second. Lalli placed third showing success in almost every situation, playing the day rather conservatively. Rogers made an excellent recovery to finish in fifth. It was just enough to place him even in points and on an even line with Woods for first overall. It was great first day of racing for the British colors. Melges 32 Euros are On! Audi MedCup: ALL4ONE Ready for the Off!